Groundwork Lawrence Named "Conservationists of the Year"
As the days grow shorter with winter on the horizon, it's only natural to reflect on what's been an energetic year of transformative projects, meaningful programs and strong partnerships. With so much uncertainty in our midst, I take comfort in knowing one thing is clear: without your support and hands-on involvement in our endeavors, Groundwork Lawrence could hardly have achieved all that we accomplished this year. With this newsletter, please accept my heartfelt thank-you for donating your time, talent, resources and energy to help us achieve our mission. Thursdays at 7:40 AM. Heather joins WCAP's Merrimack Happenings morning show to talk about what's going on at GWL and what's happening in Lawrence. You can listen live online or by tuning into AM 980. 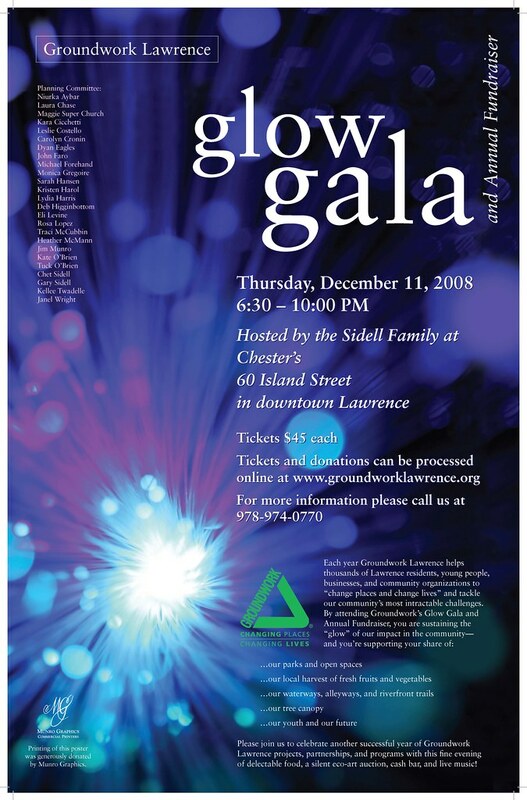 Join Groundwork Lawrence in celebrating another successful year of projects and programs at our Glow Gala and Annual Fundraiser on Thursday, December 11th, 6:30 - 10:00 PM. The event, hosted by the Sidell Family at Chester's (located on the first floor of 60 Island Street in downtown Lawrence), will offer an evening filled with delectable food, a silent eco-art auction, cash bar, and live music! We are still seeking "eco-art" pieces for the Glow Gala silent art auction. If you are interested in submitting artwork, please visit our website or click here: eco-art guidelines & registration form. See photos of artwork from last year's Glow Gala! As part of the Groundwork USA national network of nearly 20 other "trusts", Groundwork Lawrence shares its mission to "change places and change lives" by leading on-the-ground projects, programs, and partnerships. In each of our communities coast to coast, we respond to local needs by engaging residents, business owners, civic leaders, and youth in hands-on work to create positive change in some of our country's most underserved areas. Like TTOR, Groundwork Lawrence is a land trust, meaning we actively work to conserve and improve precious urban natural resources-- like our rivers, trees, and vacant, underutilized spaces. We are honored to have received TTOR's "Conservationist of the Year" award because it illustrates how our work is increasingly recognized by traditional land conservationists as a crucial, holistic piece of the environmental movement-- for making our cities more sustainable means making our society as a whole healthier, more enjoyable, and more opportunity-filled for everyone. In cooperation with the City of Lawrence Community Development Department, Groundwork Lawrence is leading the renewal of the City's 2009 Open Space and Recreation Plan. 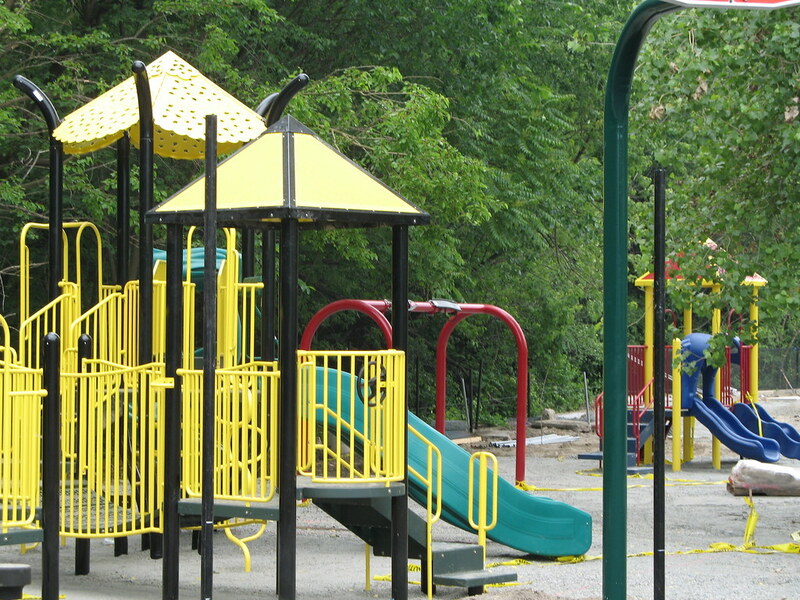 The Plan, updated every five years and submitted to the Massachusetts Division of Conservation Services, maintains the City of Lawrence's eligibility for State parks and open space funding. At the same time, the Plan helps the City identify and prioritize its investments in parks, open space, trails, and other recreational amenities. To gather feedback from the public for the renewed Open Space Plan, Groundwork Lawrence led three community meetings attended by dozens of residents, interviewed a variety of civic leaders, and made presentations to local neighborhood associations and municipal boards. We are still soliciting feedback with our bilingual survey, which we'll be collecting through the end of November. If you're a Lawrence resident and would like to complete a survey, please click here! Read more about the Open Space Plan process. 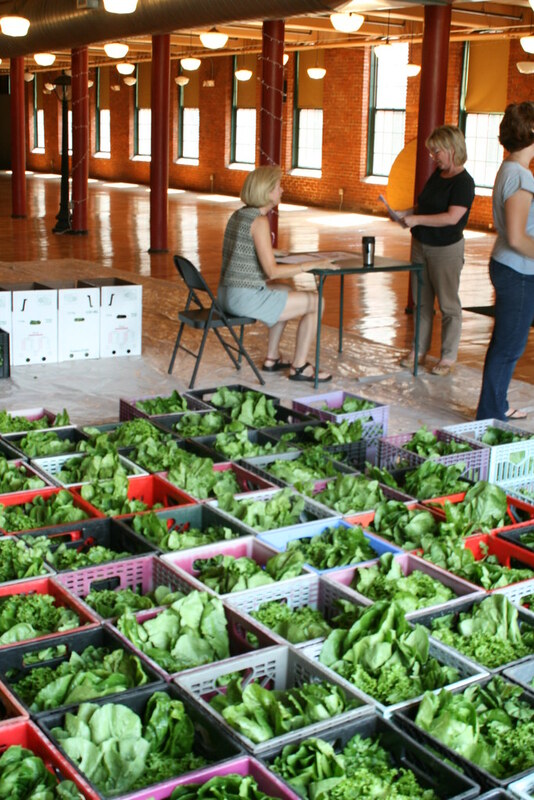 CSA's 2nd Season Makes a Bountiful Impact! We've just wrapped up the second season of the Community Supported Agriculture (CSA) program, which we operated in partnership with Farmer Dave Dumaresq of Brox Farm in Dracut, MA. This year we more than doubled our CSA membership, with over 150 shareholders purchasing their share of the harvest, and we learned that our CSA is making meaningful impacts in the lives of our members. Through the course of the season, members reported enjoying a variety of benefits to CSA membership, including: learning a variety of new ways to cook and store vegetables, discovering new favorite vegetables, understanding what grows locally, experiencing hands-on what it means to eat in season, and feeling healthier by eating more fresh fruits and vegetables! Our CSA is making a positive impact on non-CSA members, too. Each week, all of the shares left unclaimed at the end of pick-up day were donated to Neighbors In Need, a local food pantry that provides at-risk families in Greater Lawrence with food and other basic necessities. Thanks to the generosity of our members, Groundwork Lawrence facilitated the contribution of 4,774 pounds of fresh, locally-grown produce to Neighbors in Need, as well as an additional 205 pounds of canned food donated by our members. If you are interested in joining our CSA next year, please email Rowan to be added to our 2009 waiting list. Please note that former CSA members will receive first priority in the event that shareholder demand exceeds our capacity. Groundwork Lawrence's 2008 Farmers Market season came to a close on Wednesday, October 29th. Despite a very rainy summer, we counted several hundred people coming through the market each week to buy fresh, locally-grown fruits, vegetables, plants, honey, eggs, and baked goods. In addition, our market benefitted from a vibrant selection of live world music offered at lunchtime on five market days through the Live Lawrence! free summer concert series. Please join us next summer (opening day TBD-- stay tuned!) 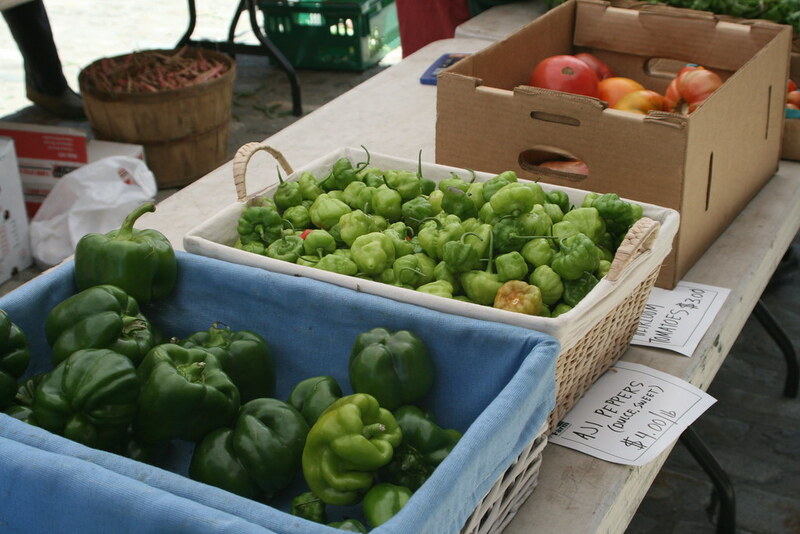 for the market's 15th anniversary of providing fresh, locally-grown produce right in the heart of downtown Lawrence! 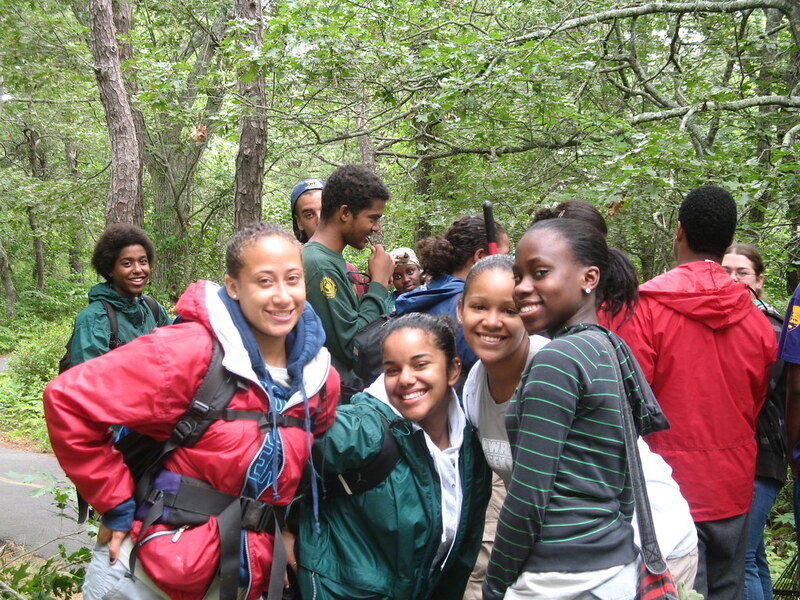 Year-Long Green Team Program in Full Swing! With the dual goals of learning about the facets of a healthy community and working to achieve it in Lawrence, the Groundwork Lawrence Green Team year-long program is now in full swing! Ten students, including 9 from Lawrence High and 1 from the Greater Lawrence Technical School, make up this group of motivated, hard working leaders who will be spending the next year working on many exciting hands-on projects and awareness-raising initiatives. To date, the Green Team has exercised their civic engagement responsibilities by collecting community input and providing feedback for the City's Open Space Plan, as well as the design of the soon-to-be new Manchester Street Park. They've also recruited their peers to join over 500 volunteers who took part in our 7th Annual Spicket River Cleanup, and gave Congresswoman Niki Tsongas an insider's tour of Scarito Park and our community gardens there on Rivers' Day in October. This fall, the Green Team has begun planning a campaign to encourage their peers in the high school to recycle, an effort they hope to eventually take city-wide. They'll also be further engaging in the community by creating "eco-art" for Groundwork Lawrence's upcoming Glow Gala & Annual Fundraiser, which will feature a juried eco-art show and silent auction. In keeping with the "eco-art" theme, each piece must incorporate one of the 3R's (reduce, reuse, or recycle), and must promote greater environmental awareness, which is what Green Team, in part, is designed to do. Over the winter and this spring, Green Team will continue to explore what it means to live in a healthy community by examining and understanding themselves as individuals and as budding young leaders here in Lawrence. Toward that end, Green Team will be guided through this process with our 'Eat Right, Move More' curriculum, designed to encourage young people to develop healthy habits by making sound food choices and increasing physical activity. In addition to examining their own habits and developing personal goals, Green Team members will also look at our urban environment and set goals for addressing the many challenges and opportunities for better health in Lawrence. Stay tuned for more information from our Green Team leaders! Save 5% and Donate to Groundwork Lawrence at Rose & Dove! Come in and shop Thursday, November 20th thru Wednesday, November 26th and we will take *5% off your cost of the item and donate an additional *10% of your sales back to Groundwork Lawrence! *Coupon cannot be combined with any other promotion or fundraiser event. Excludes alcohol and gift baskets. Rose & Dove is located at 181 Canal Street, Lawrence, MA 01840. Open Tuesday through Saturday, 10 am to 5 pm.